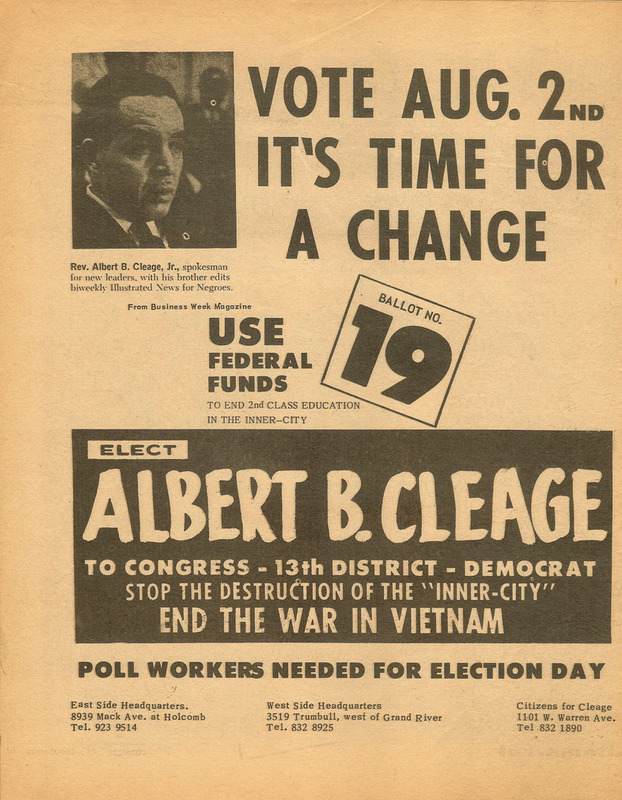 Flyer for political rally. – click all images to enlarge. Another News photograph from the rally. Rev. 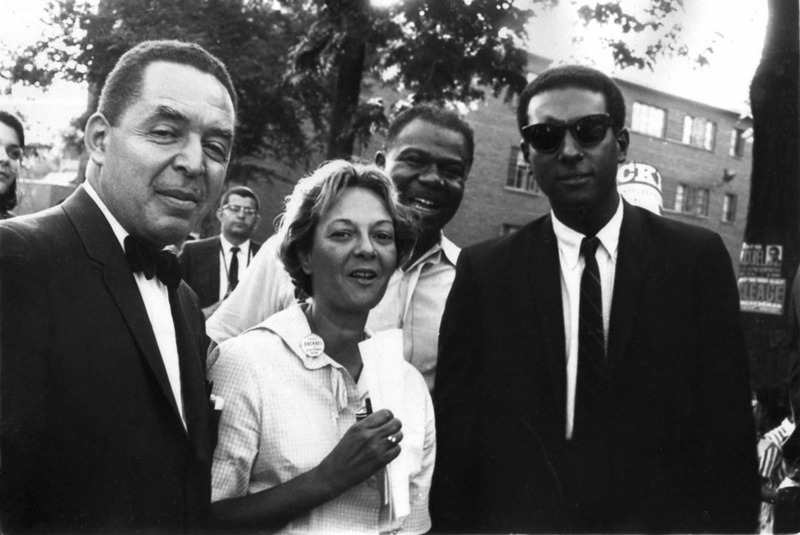 Albert B. Cleage Jr., Leontine Smith, Oscar Hand, Stokely Carmichael. 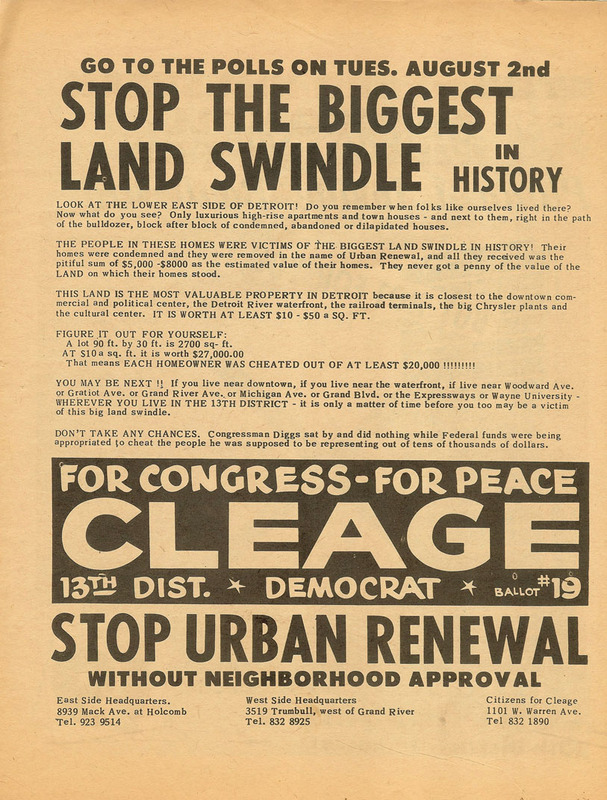 Below is a newsletter from the Cleage for Congress campaign. Unfortunately neither my father or Ken Cockrel won. 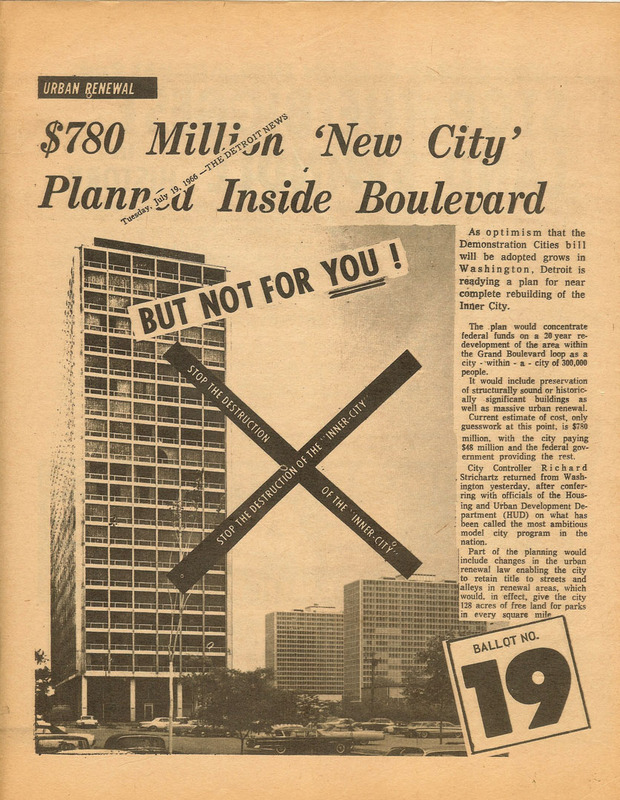 I remember passing out campaign literature at Jefferies Projects all day with Jim, now my husband, and attending Ken Cockrel’s “Victory Party ” that night in a flat on Wayne State University’s campus. I just remember it as being almost devoid of furniture and dusty. Jim and General Baker gave me a ride home after midnight where I found that my father, who was supposed to tell my mother that I was going to the party and would be late, got involved in his own after election activities and forgot. Talk about talking fast. I was 20 years old. 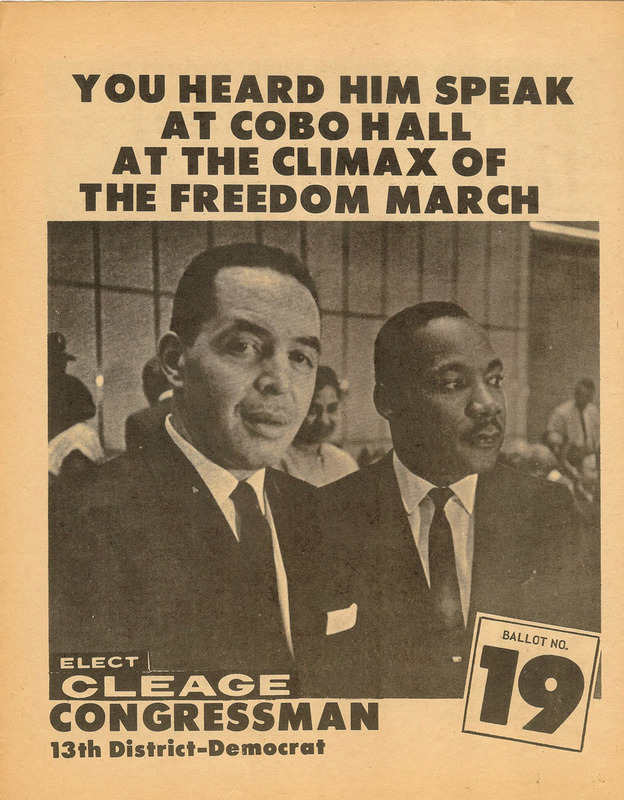 To bring history back to the present, read The Roots and Responsibility of Black Power – a reprint in The Michigan Citizen of remarks by historian Paul Lee made at the Detroit City Council meeting on Tuesday, April 3, 2012. He wasaddressing the takeover of the government of the majority-Black city of Detroit by Michigan’s Republican governor. 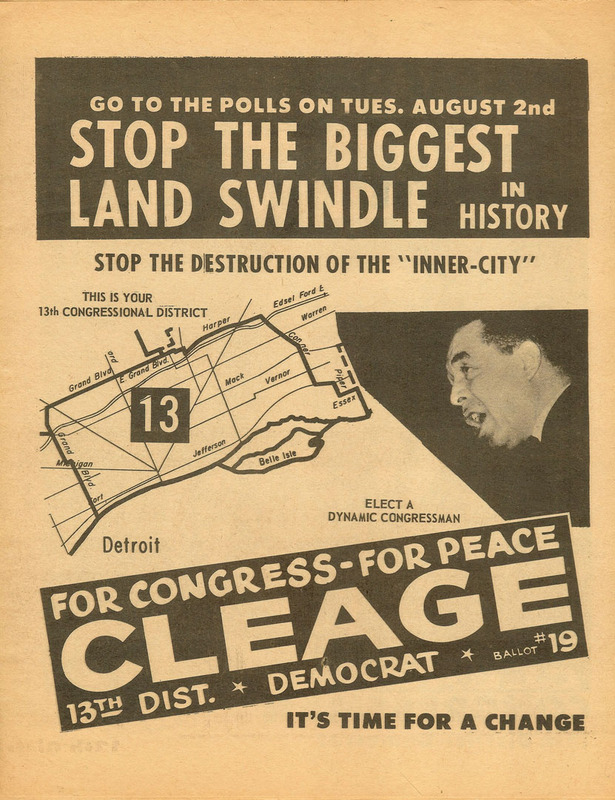 He appealed to their sense of history, to the struggle that Detroiters had gone through in the past to gain political power. The Council voted to turn the city over to a manager appointed by the governor. For more Sepia Saturday posts, click! I knew you would have something interesting for this theme. It made me look for what different political campaign stuff I have. Rev. 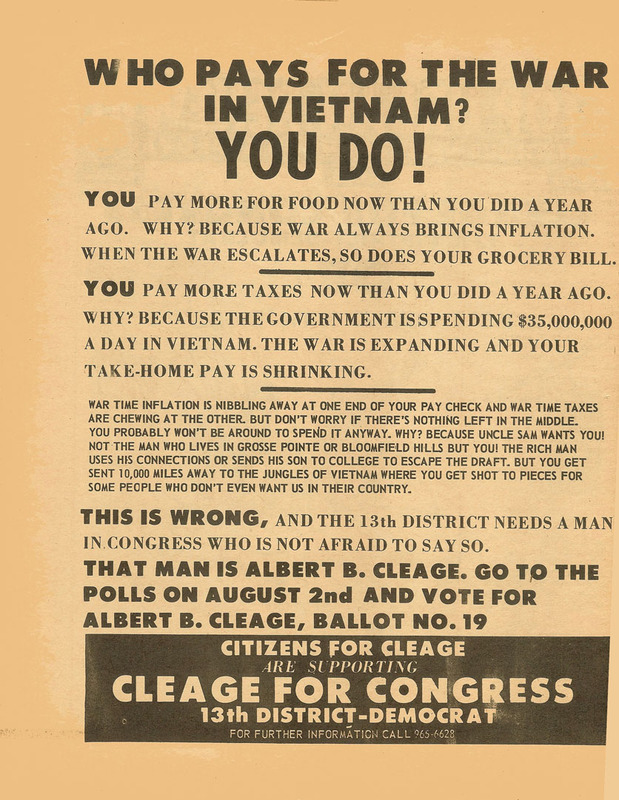 Cleage was NO JOKE! The Real Deal for sure! Talk about a perfect prompt! 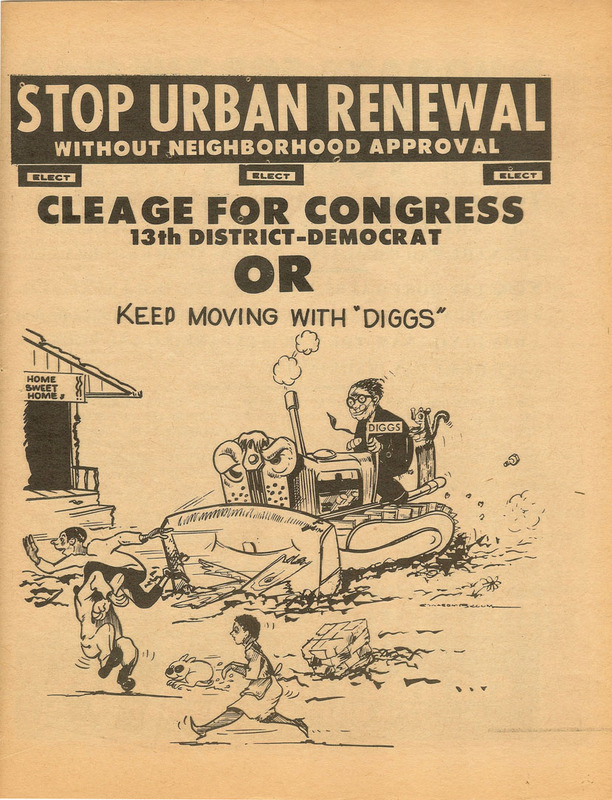 Those old flyers are so interesting – especially the “Keep Moving with Diggs” one. Pretty funny. Campaign brochures certainly had a different look from today’s slick and polished flyers. Sure did. They have gotten ridiculously slick. Ah, a man of truth and integrity, who tells it just like it is. Sigh. 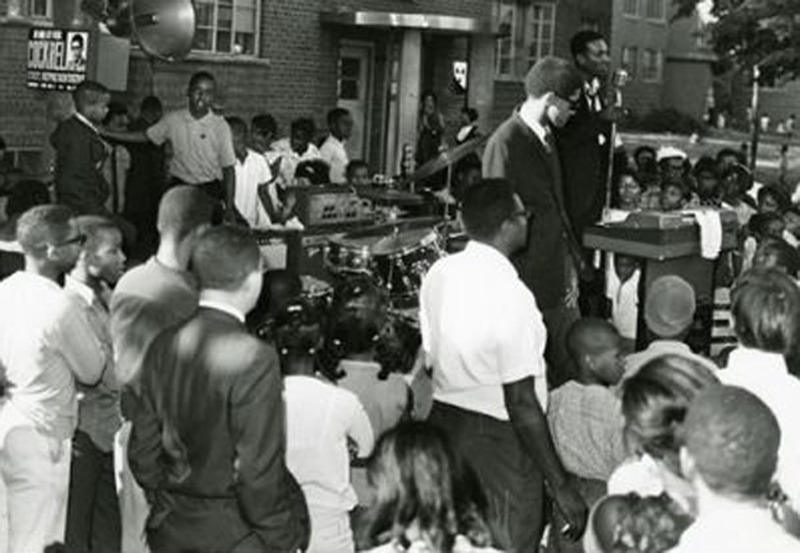 Your posts help Detroiters–and us all–remember their history of community organizing and struggle. Let’s hope that one day soon they throw out the governor’s appointee and put in a people’s candidate like your father. What a lot of amazing memories you and your husband share! Love the campaign flyers. Like Luckie said, your father was the real deal! Great man. Thank you for sharing all these flyers. Kuddos for keeping the memoribelia from 1966 elections! What a media difference from today’s elections. And you were there too, which makes it all the more memorable. 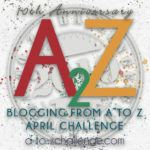 Posts like this one are one reason that this blog is one of my absolute favorites. I always find all of the artifacts from the mid years of the 20th century, and your up-close stories about how your family was involved in the civil rights/Black Power movement and the Black community, really interesting and thought-provoking. 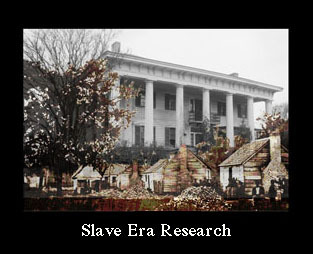 As a white who was growing up during this era in a small rural community, I had no understanding of the larger context. I’m learning so much from you about the wonderfully vibrant Black community, and alternate visions that may had had much potential to move the nation forward in ways that could have been very positive. 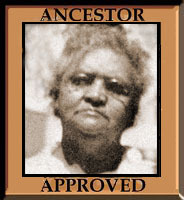 These and the posts where I’ve made discoveries about my ancestors are my favorite ones to do. You were much closer to the political scene than most of us! Too bad your dad didn’t win. There’s no way of knowing, now, of course, how much of a difference he might have been able to make, but it sounds like he would have done everything possible to save the neighborhood. Sadly, this sort of thing happens too often in too many places. That doesn’t, however, make it any less traumatic for the people involved! There are some good people running for office in Detroit right now and I hope they win. Could make all the difference. I just knew you’d be on the button with this one. 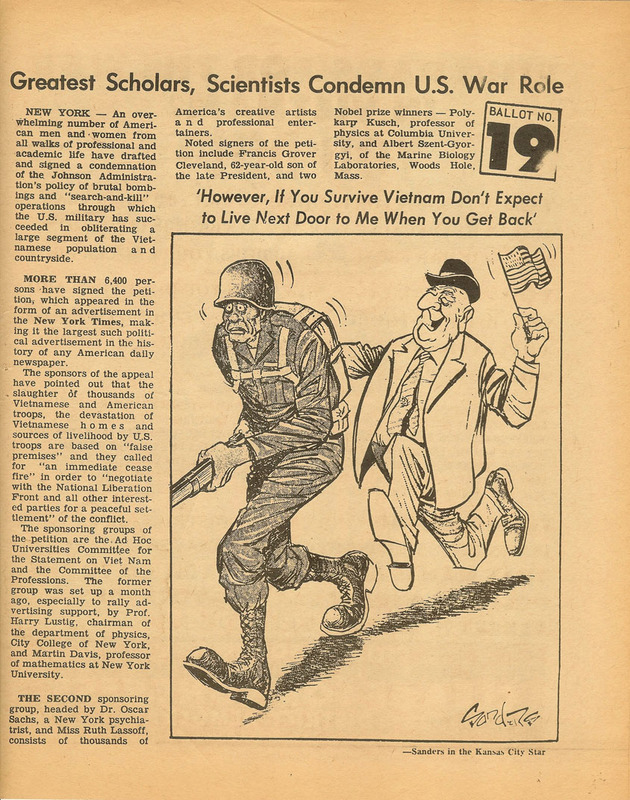 A great collection of photos and newsclippings. 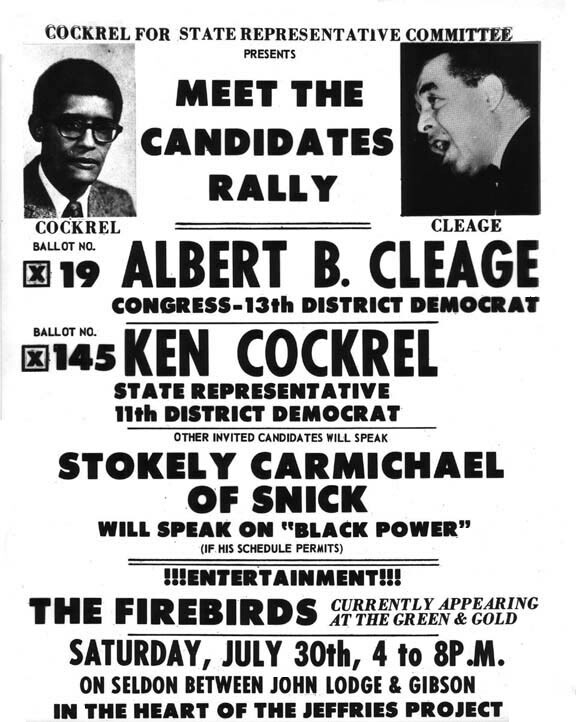 Even I had heard of Stokely Carmichael. Come clean now Kristin; had you heard of Harold Wilson (in the prompt pic)? Yes, I have heard of Harold Wilson. I didn’t recognize him by sight but I do know he was the Prime Minister. What a fabulous post! (I have to confess I have never heard of “Snick”…what is that?? A perfect fit for this weekend. I don’t know Detroit’s history but I have read about the recent financial crisis in the city and it seems that the names may have changed but the problems stay the same. They seem even worse now because there is so much decay and not even a pretense of voting rights any more there in Detroit. Well, maybe a pretense. There would have been plenty of handshaking done in a political campaign. Amazing post, Kristin! Brought back lots of stuff for all of us. I wonder, though…have things really changed, or have they simply taken less blatant strategies? Loved this post; loved it! In Detroit today, they aren’t even less blatant. Learned so much again about this era from reading about your fascinating family. Mr. Sanders the cartoonist is still creating cartoons at http://sanderscartoon.blogspot.com/. I hadn’t heard of this. Such interesting reading. Good post. I am very impressed (as usual). This is the first post that I have read and it will be hard to beat! As a regular visitor to the Detroit area I found this post fascinating. So many of the slogans hold true today. Detroit seems almost out on its feet. An amazing post when put into context with today in Michigan. The governor taking over entire cities with his pick as to who should run them. Who’d have thought that this would be the future. I’m pretty sure nobody thought this would be the way things were going to turn out. Of course, the game isn’t over yet.